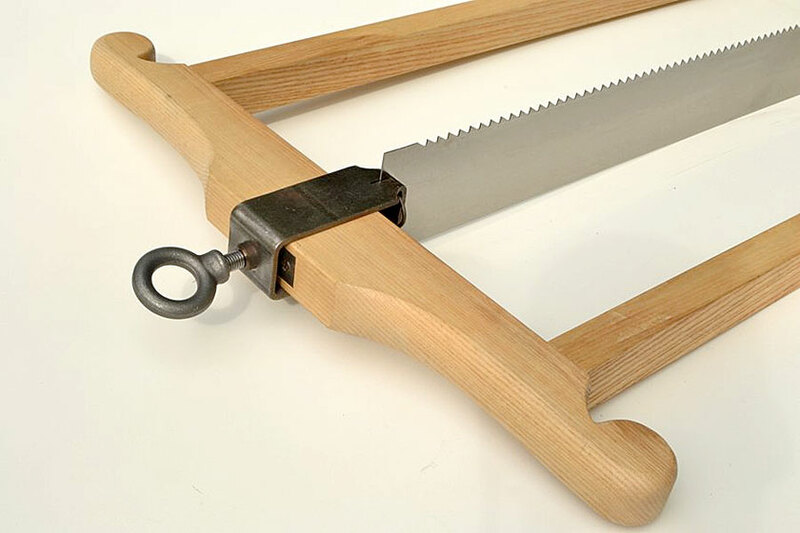 For those interested in learning and practicing woodworking as it was done in centuries past, or with a special piece of wood too large to run through your bandsaw, these frame saws offer a viable method of resawing lumber and ripping planks. Inspired by and patterned after the large frame veneer saw described by Roubo in the 18th century, parts for these saws are now available in three sizes for even greater versatility. Blades and hardware are available together as a complete kit (you supply only the wood for the frame) for a modest savings. The hardware comes in a small and large version. The small comes with the smallest blade, the large with the two larger blades. 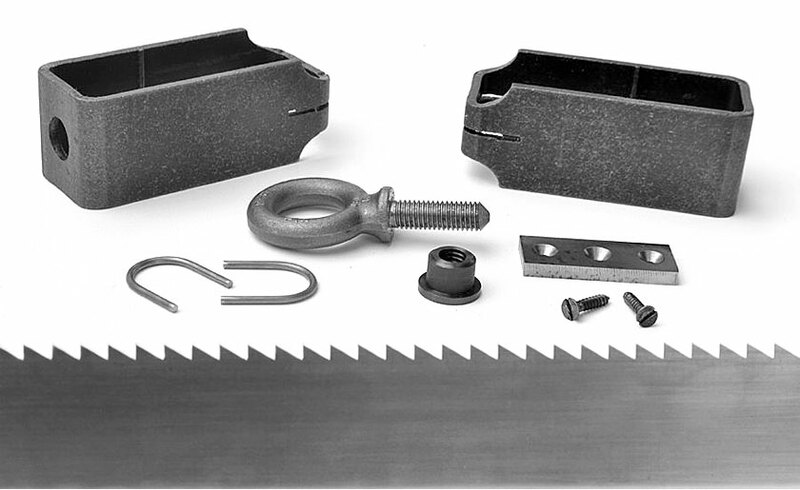 All parts are made from steel, and are sized to generate and withstand the considerable tension that makes these saws function well. Ready to install, with the exception of the steel brackets, which have a small welded seam on the inside that should be filed down. This is a few minutes of work with a coarse file. The blade is available in three sizes (see table below). Blades are bright steel; this is not a fine polish or mirror finish, but is perfectly serviceable. They can be used as they come, or sanded to a more polished finish before sharpening. Because these saws are meant to cut fast, the teeth are approximately 0° of rake. The blades come sharpened. They are jointed, set, and sharpened to high standards, and are ready to cut (they may require side dressing to fine tune the tracking, which is explained in the sharpening instructions). The teeth are set for use in dry woods. If you will be working primarily in green woods, you need to add a little extra set to prevent binding. The best saw set for these blades is an old Stanley 42 saw set (not the 42X which looks similar). The steel used is Premium 1095 spring steel, hardened and tempered to Rc 48-51. Blades are NOT taper ground. Blades feature an untoothed section at the front of the blade for easy and accurate starts. The hardware & blade kits are available in 3 sizes (see table below), this kit combines the blade and the hardware for everything (except the wood) needed to build the best frame saw on the market today. Wood is not included. 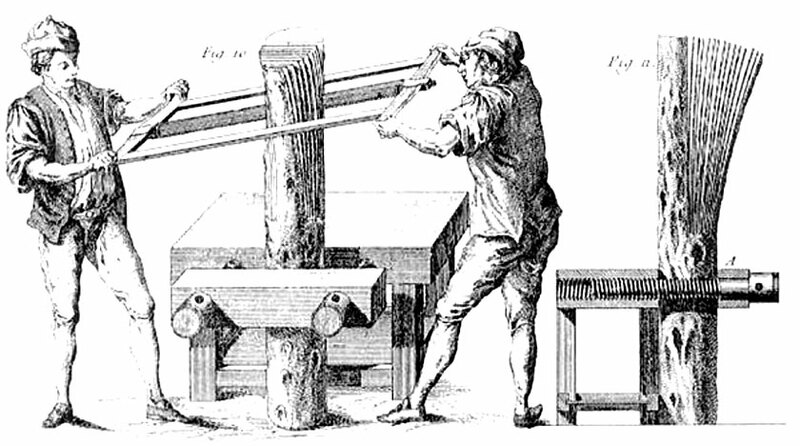 Many species of wood will work, although woods with high bending strengths are preferred for the arms. Ash, hickory, cherry, soft maple, poplar, and many others will work well. See the dimensioned templates for the hardware you are using (small or large) for the required dimensions of the wood stock. Note: Depending on your printer, the dimensions in the two assembly instructions may not be exactly to a scale of 1 : 1! Bear this in mind when you are working with this documentation!